Ok, so I’m whipping out my A-game right away this holiday season. Yup. 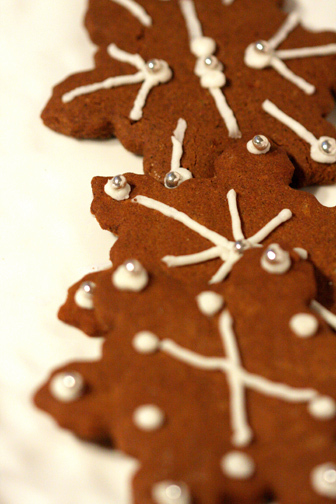 Check this out- Gluten Free Vegan Gingerbread cookies that are sweet without refined sugar, spicy, crispy, and zero xanthan gum! BRING IT. Tell your gut its time for happy holidays with this cookie. And icing? Try this recipe. Note: If you’re looking for more gluten free holiday cookies, check out my Gluten Free Vegan Shortbread, Gluten Free Vegan Molasses Gingersnaps, and Gluten/Dairy/Egg Free Pumpkin Spice Cookies. Note: Make sure to roll these out thin! Mix all the dry ingredients in a bowl. Sift them. (The coconut sap will have chunks, its ok, mix them back in). Cut in the virgin coconut oil with a fork, pastry cutter, or pulse in a blender until the mixture resembles fine crumbs. Stir in the rest of the wet ingredients. Chill the dough for 15 minutes in the fridge to solidify the fat content. Roll out approx 1 cup at a time between two sheets of wax paper, to 1/8 inch thickness. Cut out your shapes. If its too sticky, refrigerate longer. (you may wish to spread a thin film of olive oil or a little bit of starch on the paper to cut down on sticking. Bake at 350 for 7-10 minutes on a parchment paper-lined cookie sheet (if you use palm oil, increase to 12-15 min). The cookies will be quite soft, but turning golden on the edges. Let cool for 30 min on the tray, then remove to cool for 2 hours on a rack before eating (the agar agar must have time to set, and the coconut oil must get solid at room temperature). Tapioca Starch: arrowroot, potato, or corn starch. Coconut Flour: ¼ cup chickpea flour plus ¼ cup teff flour. Coconut Sap: brown sugar or sucanat. Agar Agar Powder: 1 tbsp unflavored gelatin, or try 2 tbsp ground flax or chia added to wet ingredients. You could also try 1 tbsp psyllium husk. Coconut Oil: palm oil, shortening, or butter. Maple Syrup: agave nectar or honey. Thanks for the information…trying this tomorrow if I can find all the ingredients! awww Lili thank you so much!! ok, lets see here… first of all, birch sugar sounds fabulous, where do you get it? i MUST try some! 2- also, if its delicate, freeze the rolled out dough on parchment paper or wax paper before cutting shapes- should hold together better that way. 3- bubbles…. oh! ok, it could be your birch sugar if it is in small clumps- it will melt and cause the bubbles. Alterhatively, the coconut oil- if its a touch chunky, it will also melt and cause bubbles. You can melt the oil completely before adding to your ingredients, insteado f chopping it up, and just make sure to refrigerate or freeze the dough for a bit so it hardens enough for rolling. 4- the dough lasts for ages- definetly in the freezer till the 21 no problem . to unthaw, pull it out and let it melt overnight on the counter top at room temp. 1. the dough was super delicate …do you think if I use eggs it will bind better? If so do you know how much? 2. Mine came out with bubbles all over them which didn’t make them as pretty as yours…do you know what could have caused this? maybe too high a temp? Wow! Thanks so much for the quick response and helpful info; you’re amazing. :-) Happy holidays! I’ve never heard of molasses being distinguished as “cooking molasses”; what is that? I’ve HEARD of fancy molasses but don’t know what that is either. Can you enlighten me and perhaps offer some standard molasses substitutions? I only have Wholesome Sweeteners organic molasses (blackstrap, unsulphured). Hi! I had asked you before what a good sub for sweet rice flour would be and you said millet but I can’t remember if you said anything else I should do…and I can’t find that post on fb…can you tell me once more? Thank you!!! These look incredible. 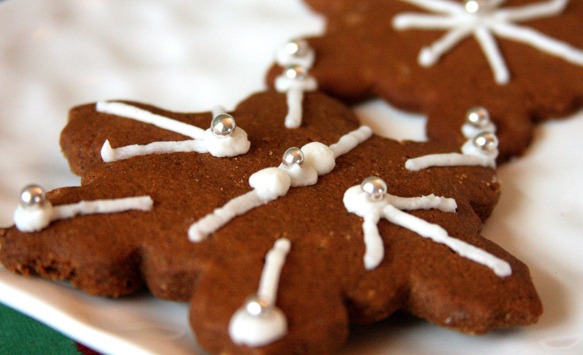 Would they be solid enough to build a gingerbread house? Hi! Just wanted to let you know that I featured this recipe in my post, “An Allergy Friendly Christmas Tea Party” with a link back to you. Thanks! These look fantastic and no xanthum gum-yeah!